This is less about the sky, although that’s important, than it is about Sam running freely down the beach. You can’t see him, but Nick is right behind. Maybe I’ll add Nick when I do a larger version of this one. For now, the contrast between skin and sand and sky are what made me want to try this one. 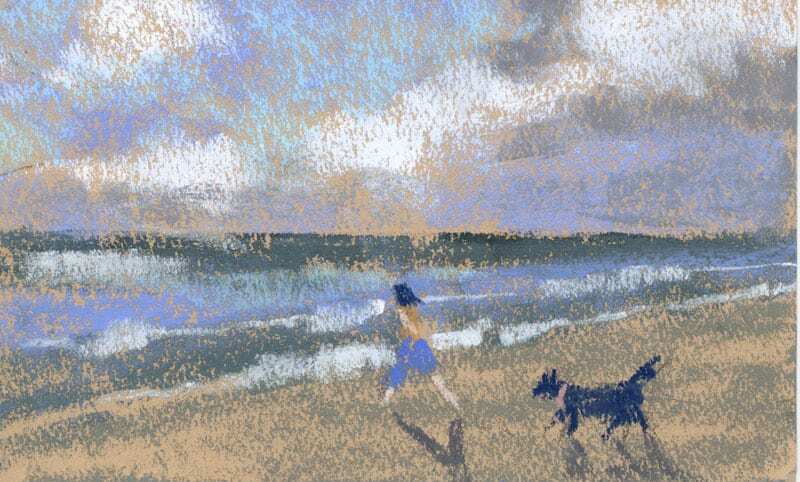 Sam’s Glee (at beating his younger brother in a race on the beach), 5×8″ pastel on paper by Marie Marfia. $75, unframed. Contact me to purchase. 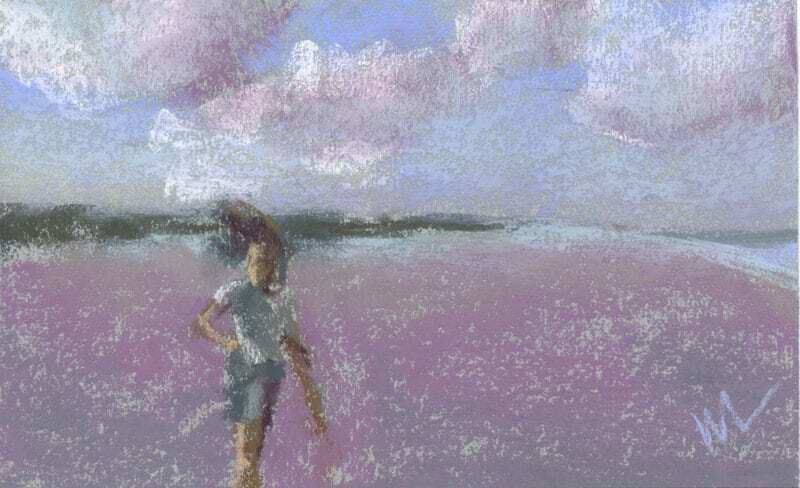 This entry was posted in A pastel a day, painting a day, Pastels, seascape, Skies and tagged art, beach, painting, painting a day, pastel, portrait, sky on June 26, 2016 by Marie Marfia. This study is based on another picture looking out at the end of US-10 in Ludington, probably late fall. That’s the time of year when the sunsets are spectacular and the clouds fly low and dark at the end of the day. I’m really looking forward to being up there again, doing more clouds. This series has been an eye opener for me in a lot of ways. First, I’ve discovered that I really like painting clouds, and the moodier they are the better I like them. Second, it’s good practice to be looking up all the time instead of down. Just gives you a better outlook on life, I think. 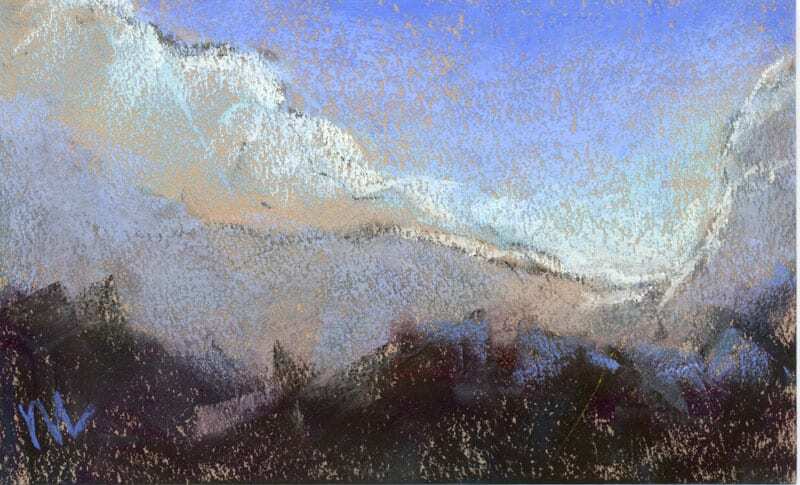 Stormy Weather, 5×8″ pastel on paper by Marie Marfia. $75, unframed. Contact me to purchase. This entry was posted in A pastel a day, painting a day, Pastels, Skies and tagged painting, painting a day, pastel, series, sky, small art on June 25, 2016 by Marie Marfia. This is a painting taken from a photo of clouds looming from beyond the trees on our way home from the beach one day. I wanted to leave some evidence of the original drawing in this study. I like my initial sketches and sometimes feel it’s a shame to cover them up! 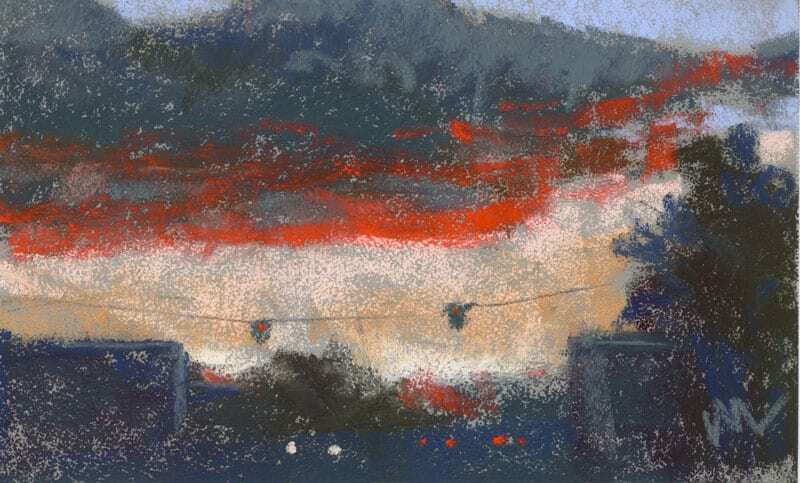 Behind the Treeline, 5×8″ pastel on paper by Marie Marfia. $75, unframed. Contact me to purchase. 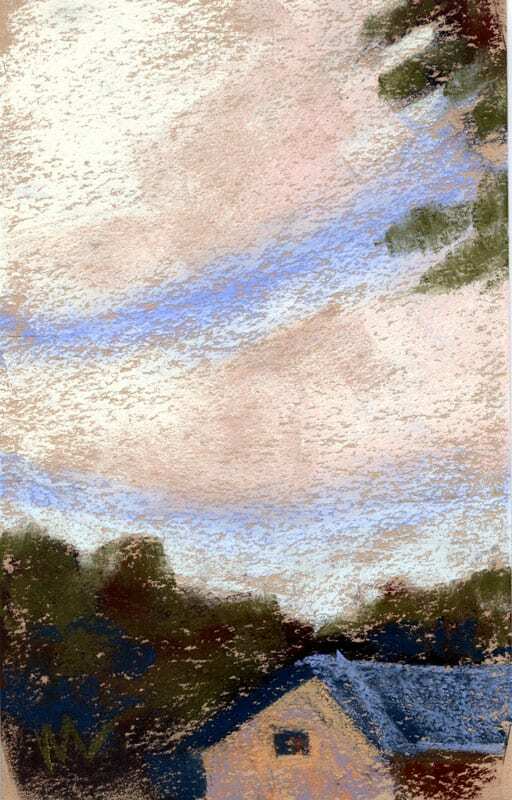 This entry was posted in A pastel a day, painting a day, Pastels, Skies and tagged clouds, daily painting, pastel, sky, trees on June 23, 2016 by Marie Marfia. This sky painting is based on pictures I saw on the National Geographic twitter feed, talking about noctilucent clouds, which aren’t visible this far south in Florida, but which I hope to see once I move back north to Michigan. 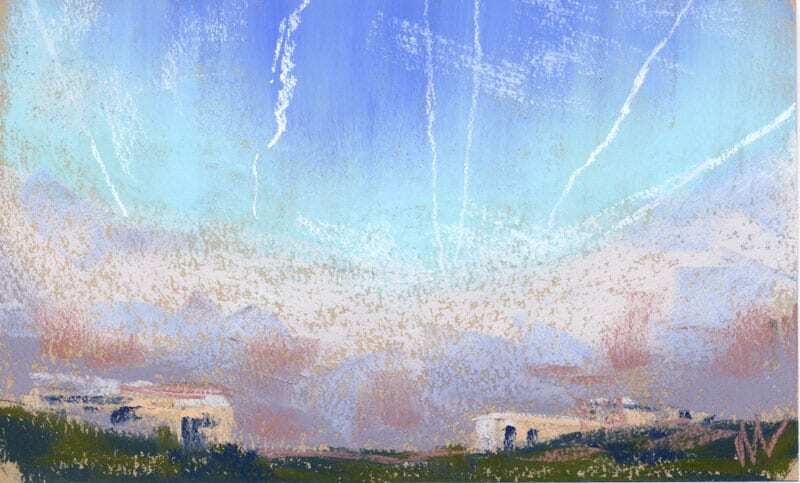 I didn’t copy the pictures for this painting, but instead I tried to remember what the clouds looked like and devised a landscape from my head to match. 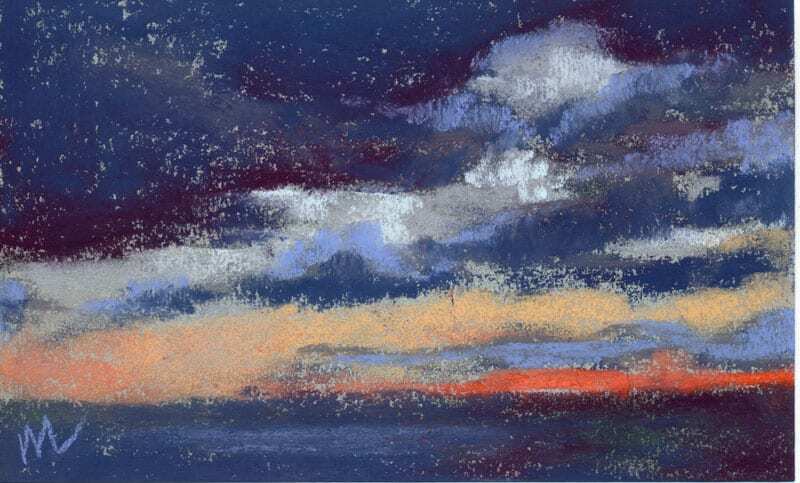 Noctilucent Clouds, 5×8″ pastel on paper by Marie Marfia. $75, unframed. Contact me to purchase. This entry was posted in A pastel a day, painting a day, Pastels, Skies and tagged clouds, painting, painting a day, pastel, sky on June 20, 2016 by Marie Marfia. Look Behind You, 5×8″ pastel on Canson mi tientes paper by Marie Marfia. $75, unframed. Contact me to purchase. This entry was posted in A pastel a day, painting a day, Pastels, seascape, Skies and tagged painting a day, pastel, series, sky on June 16, 2016 by Marie Marfia. 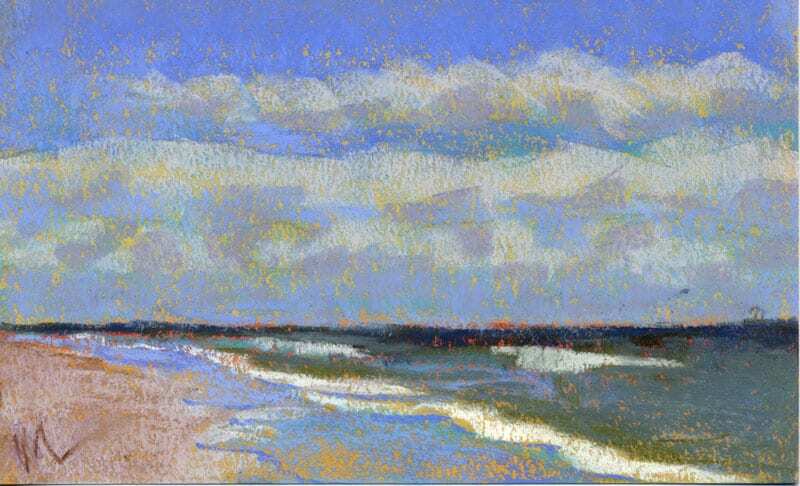 Cloudy, Chance of Rain, 5×8″ pastel on Canson mi tientes paper by Marie Marfia. $75, unframed. Contact me to purchase. 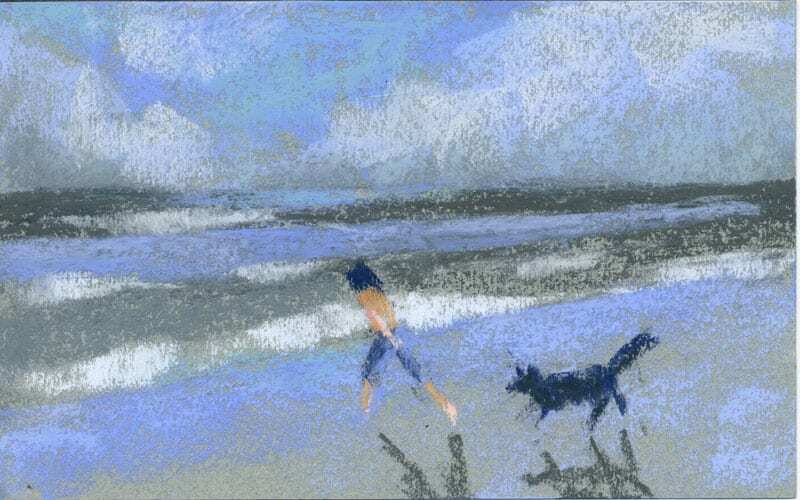 This entry was posted in A pastel a day, painting a day, Pastels, Skies and tagged beach, blue, painting a day, pastel, series, sky on June 15, 2016 by Marie Marfia. This is number 7 in the Pastel Skies challenge by Karen Margulis. I still think about this place. I rented a cottage on Half Moon Lake two years ago for my sister and me to stay in while we were in Michigan visiting family. It was a real small lake, but deep in the middle, drawing fishermen early in the day. Later in the afternoon, there’d be water skiers and tubers and jet skis out there. Mary and I would sit on the deck in our straw hats and applaud all the hijinks. We hosted the after party for the reunion and the little kids played in the sand by the water while the grownups had a cherry spitting contest on the dirt road behind the house. I remember floating on a dollar store air mattress, feeling the sun on my back, trailing my hands in the cool water. It was quite wonderful. This painting is based on a picture I took the morning that I left to go back to Florida. 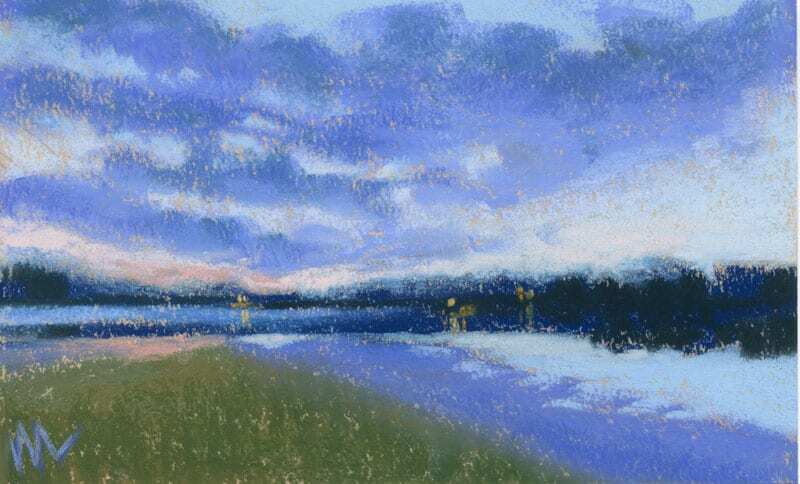 Good Morning, Half Moon Lake, 5×8″ pastel on Canson mi tientes paper by Marie Marfia. $75, unframed. Contact me to purchase. 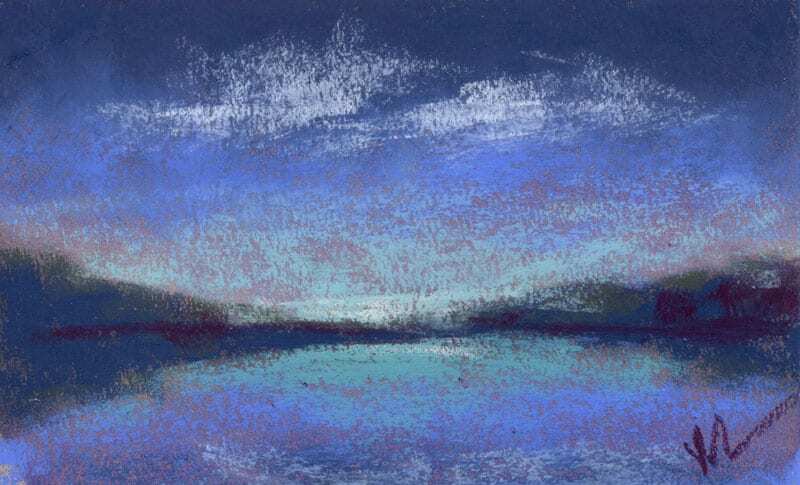 This entry was posted in A pastel a day, painting a day, Pastels, Skies and tagged Half Moon Lake, lake, morning, painting a day, pastel, sky on June 11, 2016 by Marie Marfia.